1. Where is the gallery located? It is in downtown Jersey City at 331 Newark Avenue - seven blocks along Newark Avenue from the Grove Street PATH station, or about a mile from the Holland Tunnel. 2. I'm from NYC and have never been to Jersey City - it is easy to get to you? Very easy. There are two PATH train routes from Manhattan. You can use a MetroCard on the PATH, but only the kind with money on it, not a monthly pass. The fastest way is from the World Trade Center. The PATH station is at the north east corner of the Freedom Tower (1 WTC). Take the train marked toward Newark for 2 stops (about 6 minutes) - get off at Grove Street. From Grove Street walk 7 blocks along Newark Avenue to no.331 (about 10 minute walk). There is a Citibike station on the corner of Brunswick and Newark, as well as at the Grove Street PATH Station. If coming from Herald Square, Chelsea, or the West Village you can take the 33rd Street to Journal Square line. . PATH stations are at Sixth Avenue and 33rd St, 23rd St, 14th St or 9th St; and Christopher St between Hudson and Greenwich. Take the train toward Journal Square (JSQ) (about 30 minutes from 33rd St, 12 minutes from Christopher St) - get off at Grove Street. Driving is also easy (at least once you leave Manhattan). We are about a mile from the Holland Tunnel. We have shows two or three times a year, and for the duration of each show the gallery is open by appointment or during special receptions. Appointments are very easy to make - call us, or send Robinson Holloway an email: robinsonholloway@gmail.com. 4. There are photos of cats on your website, what if I am allergic to cats? This is an establishment with cats. Unless you have severe asthmatic allergies to cats, you should be fine - the space is large, open and clean, and many people with mild cat allergies have had no problem. 5. What shows are coming up? You can see the list here. If you are an artist who is interested in participating in a future group show, please send an email to Robinson Holloway with the word "artist." 6. I am an artist interested in submitting work to a group show - what do I need to know? We have an FAQ page for artists here. 7. Is it true that the gallery takes no commission on art sales? What sort of business model is that? It's a philanthropic model. 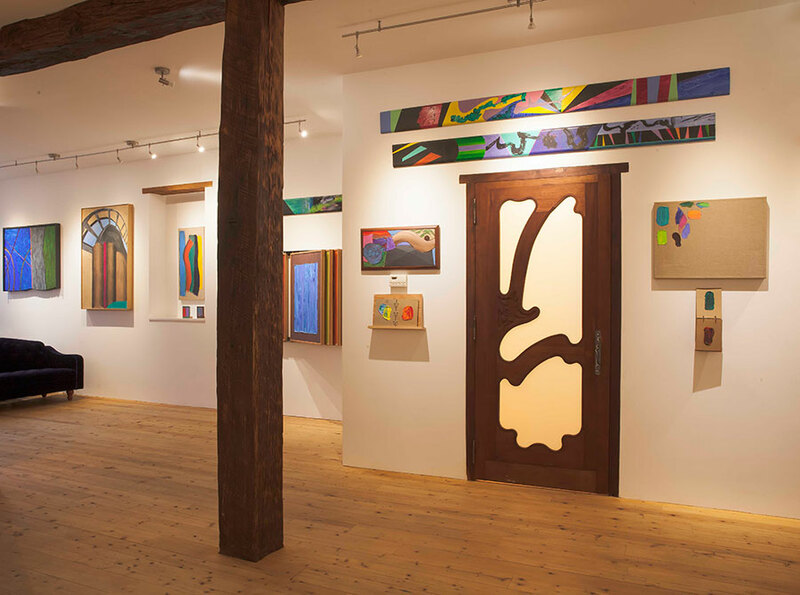 The purpose of Village West is solely to connect artists and art lovers, and foster a cultural conversation in the community. All sales of art are between the buyer and the artist, though we are happy to help with logistics and transport. 100% of all sales go to the artist, or the artist's charity of choice. 8. If I want to buy a painting, can I use a credit card? Since all sales are between buyer and artist, that depends on the individual artist. 9. How can I get on your mailing list? If you would like to be informed of future shows and receptions, please email Robinson Holloway with the words "mailing list." If you are an artist who would like to be added to the call for art for future group shows, please email Robinson Holloway with the word "artist."